As we research The First World War for our Battlefield Tours, we come across a number of accounts of heroism and devotion to duty. This is just one event during The Battle of Cambrai in November 1917. 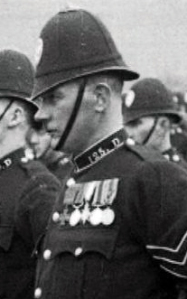 John McAulay was a Police Officer in Glasgow when World War One broke out in August 1914. He was a tall athletic man and was reputed to be a formidable heavyweight boxer. Within weeks he marched to the recruiting offices and joined the 1st Battalion, Scots Guards. He was clearly quite a remarkable man with leadership qualities since once he was posted to the Western Front in January 1915, he gained rapid promotion to become a sergeant. His devotion to duty clearly knew no bounds; on 27 November 1917 during The Battle of Cambrai, he was awarded the Victoria Cross. The 2nd Guards Brigade were holding a line between Bourlon Wood and Cantaing. The evening before, the battalion received orders to move up to Fontaine Notre Dame. At 6.50am, C Company led by Lieutenant Kinnaird, moved along a sunken road on the southern edge of Fontaine Notre Dame with a machine gun but found that within 50 yards of their advance there was no cover. They crawled to avoid the punishing machine gun fire from Folie Wood but found that they were also in danger from the houses in the village from which more machine guns were firing at them. 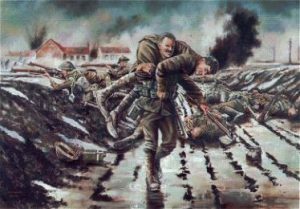 Lieutenant Kinnaird was wounded and Sergeant McAulay, ignoring the machine gun fire and exploding shells, carried him to safety; however, the officer died shortly afterwards. The battalion diary states that shortly after this the enemy counter attacked ‘but thanks to the ability and example of Sergeant McAulay who had assumed command of the Company, this was beaten off’. On our Centenary Tour of The Battle of Cambrai in November 2017, we will stand in this Sunken Road at Fontaine Notre Dame to honour his actions.